Rev. 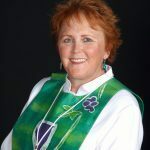 Peggy Langille joined Warwick Memorial as the Associate Pastor in July 2016. Before answering her call to ministry in 2015 Peggy was a Program Manager for a large telecommunications company. As a lay person she was a the Connect Team Leader and member of the Leadership team for Warwick Memorial. Peggy believes that authentic relationships are key to connecting people with God and that mission and small group ministries are foundational for Christian Discipleship. Travelling and spending time with friends by the water are Peggy’s favorite way to spend free time.